W. Bedford Waters, MD, Professor and Division Chief of Urology, has been named the new Urology Residency Program Director. He succeeds Frederick Klein, MD, Professor, who served as Program Director and Division Chief since its inception 10 years ago. Wesley White, MD, Assistant Professor, is Associate Program Director. Dr. Waters is highly regarded in his field. He has contributed to medical education for more than 30 years and been teaching at the UT Graduate School of Medicine since 2001. Dr. Waters is a trustee emeritus of the American Board of Urology, Inc., serving as its president from 2008 to 2009, secretary-treasurer, chairman of the executive committee, chairman of the finance committee, and chairman of the recertification committee during his tenure on the ABU from 2003 to 2012. In addition to the American Board of Urology, Dr. Waters has served as the president of many regional and national organizations, including the Chicago Urological Society (1995), the Illinois State Urological Society (2000) and the urology section of the National Medical Association (1996-1998), while also serving on the executive committees of the Society of Urologic Oncology and the Society of University Urologists. From 1995 to 1999, he participated as a member of the examination committee of the American Board of Urology, Inc.
Dr. 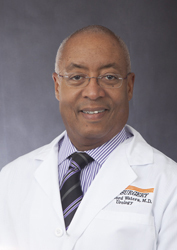 Waters was elected as an Active Member of the prestigious American Association of Genitourinary Surgeons in 2008 and was elected as a Fellow at the April 2013 meeting. Dr. Waters has been featured in the U.S. News and World Report of top USA physicians as one of four top physicians in the state of Tennessee, and in 2012, he was recognized by Worldwide Who's Who for his dedication, leadership and excellence in medical education. For the past 5 years, the UT Center for Advanced Medical Simulation has collaborated with several departments within the UT Graduate School of Medicine in a boot camp-style three day basic skills course for incoming first-year residents. 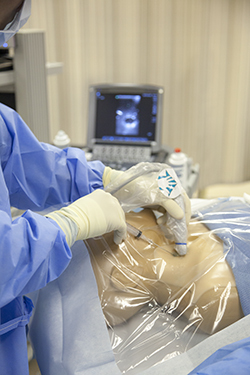 While the boot camp teaches students procedures and skills that staff have identified as necessary for first-year residents to have mastered, Paul Huffstutter, MD, Co-Director of the Simulation Center, says the time allotted is inadequate for deliberate practice and assessment of these skills. "The jump from medical school to becoming a responsible provider of healthcare for patients is high and wide. A multitude of procedural, clinical and team skills are thrust upon the first-year resident in no particular order or degree of difficulty." Through the UT Graduate School of Medicine and the UT Center for Advanced Medical Simulation, Dr. Huffstutter and Leonard Hines, MD, Co-Director, are offering a new elective course to fourth-year medical students called "Preparation for Residency Skills through Simulation." This is an elective rotation offered in the spring semester. The course will include exposure to the ACGME core competencies: patient care, medical knowledge, practice-based improvement, inter-professional and communications skills, professionalism and systems-based practice. Skills taught and practiced will include sterile technique, basic suturing and knot tying, basic wound care, urethral and nasogastric catheter placement, thoracentesis and thoracostomy insertion, central line placement using ultrasound guidance, resuscitative principles, and endoscopic skills. Literature research, communication, handoffs and team skills training will be included. The curriculum is based on procedural, clinical and team skills that have been identified locally as areas of need for entering first-year residents. A survey of residency program directors nationwide identified strengths and weaknesses of graduating senior medical students as they enter their residencies. While their strengths were in medical knowledge, supported by parts one and two of the national boards, program directors agreed senior medical students were weak in procedural and clinical skills upon entering residency. Dr. Huffstutter said, "The jump from medical school to becoming a responsible provider of healthcare for patients is high and wide. A multitude of procedural, clinical and team skills are thrust upon the first-year resident in no particular order or degree of difficulty. Very few of the first-year residents avoid the feeling of being overwhelmed by this experience. We feel that if these skills can be addressed in a more orderly manner with time for practice and feedback, our senior medical students will be better prepared for their first day of residency." The Simulation Center represents an ideal environment for the Graduate School of Medicine to provide a residency preparation course. While a similar course could be given in a non-simulated environment, Dr. Hines points out these experiences would suffer from a lack of organization and hands on experience provided in a well-equipped and well-staffed simulation center. This course is based upon experiential learning, and simulation centers are uniquely positioned to provide these experiences. Dr. Hines stresses, "Experiences can be provided in the clinical arena, however, these experiences are erratic and do not provide for practice. Simulation centers allow for planned experiences with dedicated practice and pertinent assessment. Without a simulation center, this type of education cannot be experienced in such an organized manner. Without stated learning objectives and instruction guided by those objectives, medical education becomes somewhat inconsistent in today's environment." The UT Center for Advanced Medical Simulation is accredited by the American College of Surgeons/Accredited Educational Institutes as a level I medical simulation center, one of only 73 in the world. Within the Simulation Center, learners are exposed to simulation-based education in an orderly and well-organized manner using the most advanced education methods available. For more information on this elective and other opportunities available to medical students, contact Missy Maples in Student Affairs. "UT Medical Center experts say they're prepared for Ebola, unlikely to ever be case in Knox County"
"East Tennessee health professionals prepare for Ebola"
"UT Medical Center: Ebola here unlikely, but we're ready"
"Quick Responses and Treatment Save Man who had Stroke While on a Flight"
"Knoxville Powerball winner gives $1 million to UT Medical Center"
"Lottery winner donates $1 million to UT Medical Center"
"Lottery winner donates $1 million to UTMC"
"The University of Tennessee Medical Center Recipient of Major Gift From Lottery Winner"
"Inside the World of a Radiology Department Director"